In this beautifully redone book, Apostle Frederick K.C. Price identifies areas where otherwise good Christians fall in the faith battle. For Apostle Price, the Christian life can be viewed as one long faith fight. But, as he has amply demonstrated, the fight is one that those who know Christ can – and should – win. 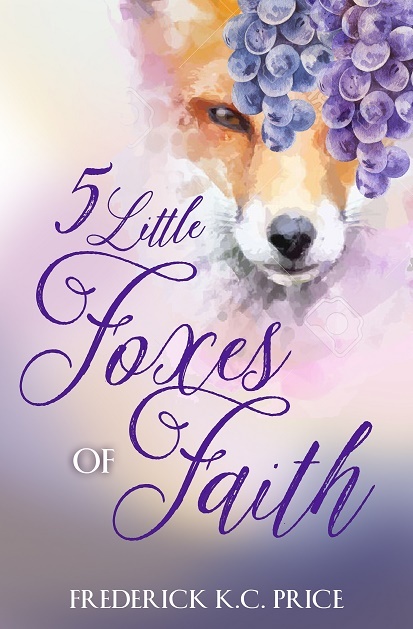 In Five Little Foxes of Faith he illustrates how one’s faith can easily be outfoxed when Christians don’t know their rights in God. It is interesting that Apostle Price leads off with the fox of Unforgiveness as the first hindrance to faith. Why unforgiveness? “And whenever you stand praying, if you have anything against anyone, forgive him, that your Father in heaven may forgive you your trespasses. Wow! So when one forgives someone who wronged him or her, it unleashes God’s forgiveness of the one who forgives! There you have it repeated three times: unforgiveness will stop faith. But God has much more to say about unforgiveness. For example, how far do we take forgiveness. The way Apostle Price computes the scriptures, one should be willing to forgive up to 490 times in a day! This book may shock you with how much you don’t know about the sin of unforgiveness. The second little fox of faith is Worry. Worry is what Apostle Price terms “The sin of not trusting God.” Worry “is one of the worst sins any Christian can commit,” he writes. Most would never dream of telling God that, but often our actions speak so much louder than what we say in words. Be anxious for nothing, but in everything by prayer and supplication, with thanksgiving, let your request be made known to God. Don’t let the term little foxes fool you. They can create big problems in a Christian’s life. Christians can easily avoid these sly foxes through knowledge and application of the Word of God. We’ve revealed a little on the first three little foxes, but the book goes into much greater detail on these and two others.